This Belgian waffles recipe is quick and super filling for everyone whether with added toppings or just dipped in whipped cream. Our kids love these for breakfast and as a snack while out and about. 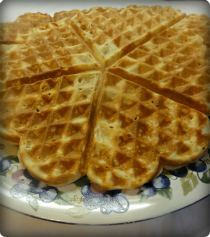 This waffle recipe takes just 20 minutes and a good waffle maker takes care of the rest. Our waffle maker makes 5 heart shaped waffles at a time and adding jams, fruits or spreads on these little waffles makes them extra hearty and keeps every tummy satisfied a lot longer than morning toast and cereal. Add whipped cream, fruit or other toppings of your choice to these Belgian waffles. Your family will love these tasty treats. They are fast to make, add a great aroma to your home and every tummy gets satisfied. We completely enjoy eating and sharing these wonderful waffles every time they are made in our home, and we always look forward to the next time 'Mom' treats all of us to them. How About A Sweet Tooth?